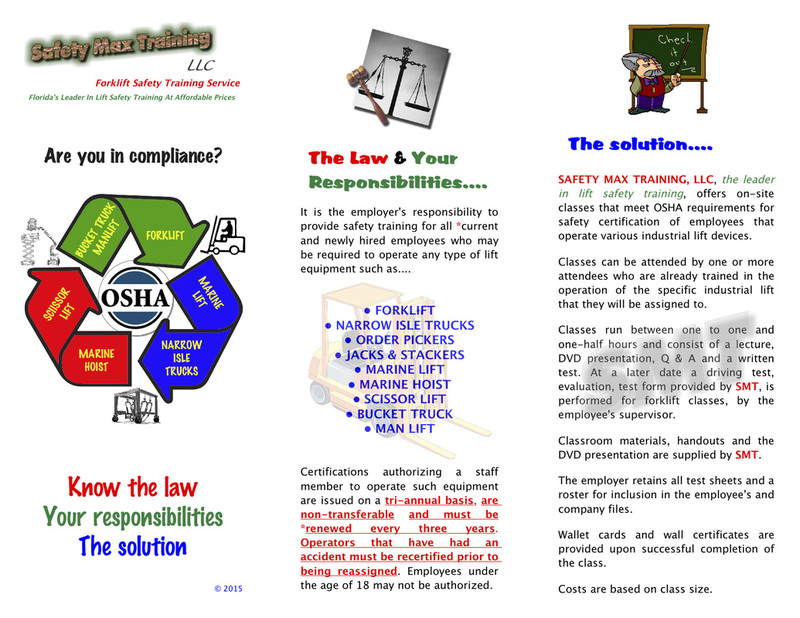 Safety Max Training, LLC, an on-site training service, specializing in safety related training for OSHA required authorization of experienced operators in Forklift, Marine Lift, Marine Hoists, Travel/Man Lift, Scissor Lift and Bucket Truck operation. 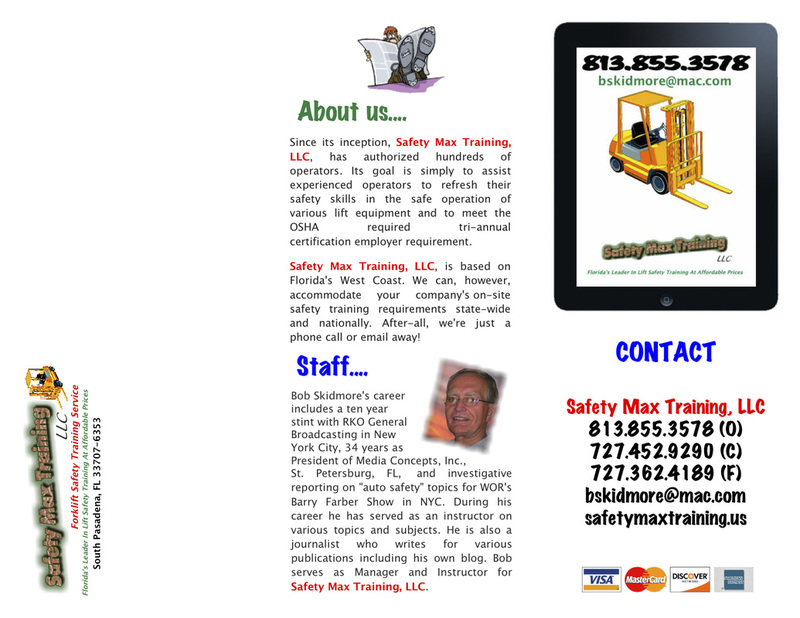 Safety Max Training, LLC, was founded by the late Marvin Brown, an experienced, well-known pioneer and industry leader. It is now managed by Bob Skidmore who also serves as one of the instructors. NON-COMPLIANCE AND WILLFUL VIOLATIONS CAN RESULT IN A MINIMUM FINE OF $7,000.00. on-site safety training requirements state-wide and nationally. After-all, we're just a phone call or email away! Each year, tens of thousands of injuries related to powered industrial trucks (PIT), forklifts, or other industrial lift devices occur in US workplaces. Many employees are injured when lift trucks are inadvertently driven off loading docks, lifts fall between docks and an unsecured trailer, they are struck by a lift truck, or when they fall while on elevated pallets and tines. Most incidents also involve property damage, including damage to overhead sprinklers, racking, pipes, walls, and machinery. Unfortunately, most employee injuries and property damage can be attributed to lack of safe operating procedures, lack of safety-rule enforcement, and insufficient, or inadequate training. It is a violation of Federal law for anyone UNDER 18 years of age to operate a forklift, or for anyone OVER 18 years of age who is not properly trained and certified every three years to do so.